Non-Welded, Assembled, Can Be Used In Exterior Or Interior Applications, Boxed Loose. Ideal use for double gate entry, by putting two gates together. Attaches directly to the frame. Helps prevent sagging and dragging of gate. Galvanized parts for long lasting protection and maximum life. Provides an anchoring rod to secure 1 side of a double gate. Easy on site assembly. For wood and composite. Steel hardware and screws included. Gate Not Included. Galvanized steel cane. Gate hardware kit with a rustic design. WeatherGuard for maximum protection from the outdoor elements. Includes: 2 hinges, 1 latch, 1 pull and fasteners. Safe working load 55 lbs. Visual-pack. Designed for surface applications on doors, gates and sheds. 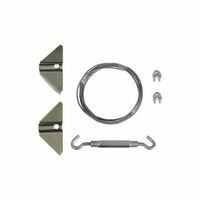 Kit includes: 1 - Gate latch, 2 - T-hinges, 1 - Pull, Mounting fasteners. Decorative pull and hinges. Visual-pack. Designed for surface applications on doors, gates and sheds. Kit includes: 1 - Gate latch, 2 - Gate hinges, Mounting fasteners, Adjusting tool for spring hinges. Visual-pack.